As the spring season brings in cool breezes, the desire to enjoy the warm season and revived nature is a given. It also brings the chance to be a part of innovative event design and décor at outdoor venues. In beautiful weather, there is not better way to enjoy it than at an outdoor event. For this wedding at Annesdale Mansion, the dining and reception festivities were held on the lawn of the historical site among its natural flora and fauna. Neutrals and pastels were chosen to create a soft contrast to the vibrancy of the Annesdale lawn. The color palette also complimented the bouquet of flowers and swaying trees that outlined the yard. To bring a whimsical and unexpected touch to the space, our crystal chandeliers and Juliet furnishings were brought it as part of the outdoor reception. The Diana and Victoria crystal chandeliers hung high from the landmark's grand tulip tree where the sun caught prismatic reflections of each crystal that twinkled with each breeze. An extra air of regality was solidified by adding the French Provincial-inspired Juliet arm chairs and love seat for guests to comfortably lounge in. Going up! That’s exactly where guests went for this event 300 feet above Memphis, Tennessee at the Bass Pro Cypress Lodge that lies at the top of the Bass Pro Shops Pyramid. 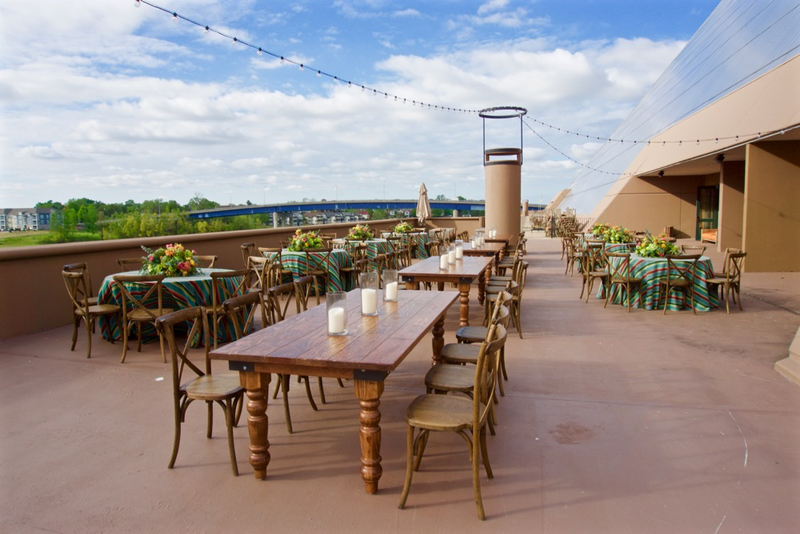 This scene of a comfortable outdoor haven was set to match the Bass Pro experience inside the Pyramid, rustic-inspired stylings were the main focus. The dining area overlooking the Great Mississippi River was filled with a mixture of our farm tables and round tables, all with our wooden x-backs stationed around for seating. Draped over several tables were Southwestern-inspired linens that added a vibrant pop of color. Lively bouquet centerpieces brightened up the varying shades of brown and tan throughout the space and accent the linens. Strong woods and neutral-colored furnishings were incorporated into the various lounge arrangements to subtly emphasize Bass Pro Shop’s wilderness scheme. An atmosphere of intimacy was created with the combination of our Juliet love seat, luxurious faux fur blankets, pillows, and Sierra tables. In addition, the pairing of our Juliet arm chairs with Singapore teak side tables offered a welcoming lounge setting for guests to mingle in comfort. Often times when designing the layout for outdoor events, a tent is incorporated to create further ambience. It allows for the ability to work with the vibrancy of sunlight as well as the glow of moonlight as the festivities continue after sunset. For this outdoor wedding reception at the Memphis Botanic Garden, it included both covered and uncovered areas that gave guests the best of both ways to comfortably enjoy the blossoming nature surrounding them. Circled around the breathtaking fountain was a combination of dining tables and cocktail bistros with complimenting floral centerpieces that create a buoyant, romantic dining setting. Ivory linens were used to balance the vibrant background of luscious greenery, with hints of gold seen in our chiavari chairs sprinkled around for an elegant pop. This design choice at the Memphis Botanic Garden event is an example of providing an unexpected element to an outdoor space. There’s always room for creativity and of course, a little fun!